Tom Ford offers no cheap thrills. His perfumes are thundering creations, approached forever with a tight hesitance. Amber Absolute is no exception, with an astonishing dense quality that concentrates the already concentrated – like cough syrup or honey. His perfumes are lavish and opulent, best served and doused sparingly and very carefully. 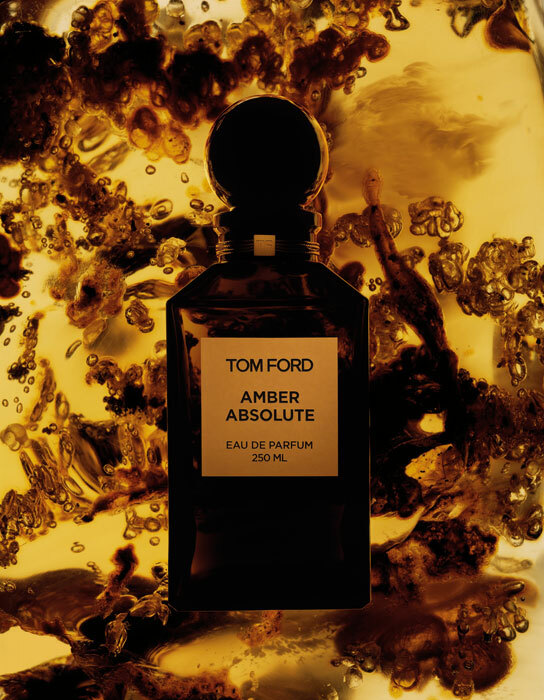 The amber ingredient in this case is given the opulent Tom Ford style of treatment, with its molasses character smoked slowly and then subjected to the decadence of sunny vanilla and olibanum. Amber for me serves as the halfway point between comfort and a staggeringly high sense of ‘shock-tactic’ exotica. Amber (a resin) on its own is rich and dense, much like a tightly compacted and resinous ball projecting firmly off the skin. When amber is in someone else’s company, it imparts both firmness and a dedicated richness that is cozy, warming, and shines a dark brown hue like lacquer. What Amber Absolute has done here is favour the shocking side of the amber spectrum over the comforting one, then washed with a creamy and decadent lactic note fused with a hint of powder. The amber notes we are accustomed to today are actually balsamic accords featuring equally warming notes of labdanum, benzoin, styrax, ambroxan, and vanilla homogenised into a comforting ‘sweet and sour’ accord. The sweet is promoted here, opening so seriously dense that it has begun to crystallise around the edges. It smells of robust butterscotch. It smells of neglected caramel. Furthermore, it surprisingly appears dry but never is. It is smoky without being charred – only giving off the impression of blaze and char. I suspect the vanilla here achieves this, dotting the thick viscosity with a new level of mature ‘grown-up’ sweetness. We reach a spicy edge as the heart note becomes more prominent, giving distinction away from the sweetness. Far in the background does cedar and sandalwood devoid this fragrance of any medicinal connotations, whilst a bouquet of dry herbs in the style of Luten’s Ambre Sultan masterpiece trail like soft pitter patter. Instead, dry fruits pair up with amber, redolent of dried prunes and plums adding a mellow hum and a detectable powdery characteristic. I find this to be a handsome fragrance, reminding me of what I thought a man would smell like as a child. It smells alcoholic and velvety like Irish cream or Schnapps as it begins, eventually burning off and flaunting its sophisticated acerbity as a powerful, cutting fragrance. The incense employed here reminds me of Ford’s later “Sahara Noir”, grand and splendid with the addition of labdanum and from what I detect, a flavoured tobacco note. This, in contrast to many ‘market-pleasing’ ambers (See: Ambre Narguille) – Isn’t scared of showcasing the quaintly urinous undertones of amber accords, as the addition of labdanum, amongst other resins, support and cheer on the amber used here. This is smoky and sweet in a grown up way, almost hairy and automatically masculine. This is like liquor chocolates, as the good stuff hides within adult pleasures. Despite the brawny and callus-male impressions, Amber Absolute remains forever a flavoured beverage and not a single malt, suffering strongly in its progression and its eventual impressions. It is loud in a manner that we expect from Tom Ford; the heels on his brand’s shoes, for example, are towering compared to other brands. Certainly showy, I often wonder if this ever approaches dicky, obnoxious, and/or excessive. This is pleasurable for the strict pleasure seekers and those who enjoy an oozing richness. This however loses its charm once all the smoke and mirrors have passed. Certainly this is enjoyable, but complex? Sort of. An arpeggio, repeated again and again … perfected. This entry was posted in Tom Ford and tagged Amber, Amber Absolute, Discontinued, Fragrance, Review, scent, Tom Ford. Bookmark the permalink. I love amber but haven’t tried this yet. Must give it a go, it sounds yummy! It’s always the way Liam! One of my top perfumes EVER. Wonderful review as always, dearest Liam. Hey Carlos! Good to see you around these parts as always. A.A is certainly an enjoyable fragrance – but then again, I’m really into transparent Ellena works or baroque classic French perfumery. This would be nice in some seriously cold weather I think. The best AMBER ever!!!! Complex n beautifullll-excellent sillage n longevity!!!!! much better than Sultam; precieux; Dore; fetiche!